On May 26th 2017 a special issue of the « Geophysical Research Letters » journal has been published gathering some 40 articles about the Juno probe’s data analysis. 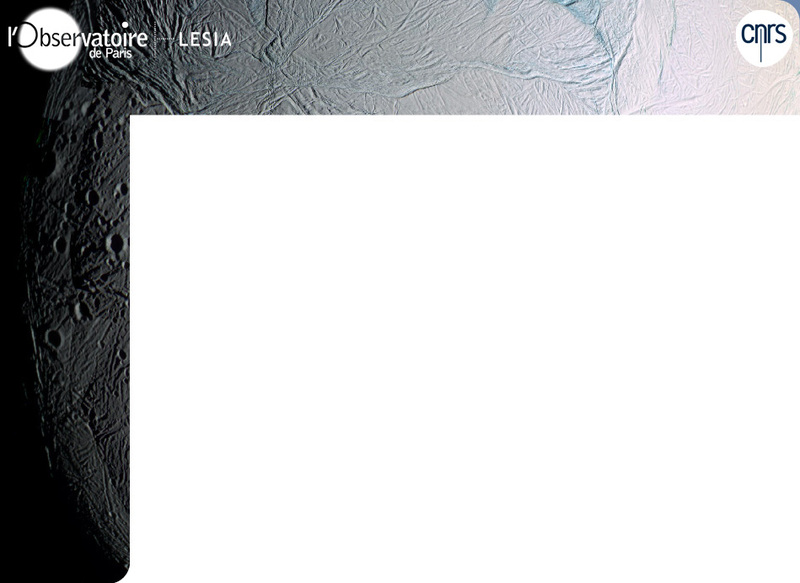 Three of those articles present works from Observatoire de Paris researchers, all being members of the "plasma" team of LESIA. Those works focus on intense radio emissions from Jupiter. The latter have been observed for a long time: from the ground, for example with the Nançay Decametrer Array at the Nançay radioastronomy station, as well as from space by several probes (Voyager, Ulysses, Galileo, Wind, Cassini ...), however those observations were always performed from the vicinity of the equatorial plane. Juno provides the very first observations from the poles, and at a very short distance (< 10000 km). In preparation for Juno’s observations, a simulation code has been developped by the Observatoire de Paris’ team. It is named SERPE (ExPRES in english, for Exoplanetary and Planetary Radio Emissions Simulator), and is based on a theoretical modelling of those emissions (Cyclotron Maser Instability, CMI in the following) as well as on the description of jovian magneto-plasma, in order to predict the dynamic spectra (emissions’ occurence versus time and frequency) detected by an arbitrary observer, moving or at rest, for example Juno. We know that the radio emissions are generated by the CMI in a largely opened conical sheet centred on the magnetic field of the source, the latter spreading along the magnetic field lines that dive into auroras or are connected to Io, Europe or Ganymede. Is the emission generated perpendicular to the magnetic field in the source (by electrons with a shell-like distribution), or in an oblique direction (by electrons with a "loss cone" distribution) ? What is the energy of the emitting electrons ? The answer has a direct consequence on our understanding of electrons acceleration in Jupiter magnetosphere, with more general astrophysical consequences (e.g. at exoplanets). The 3 recently published articles bring some new elements that will help finding the answer. The Kurth et al. article is describing Juno’s radio observations (Waves instrument) around the first periJove (on 27 August 2016). The dynamic spectra reveal V-shaped radio emissions that can be attributed to sources restricted to small sets of magnetic field lines (auroral hot spots or Jupiter-satellite magnetic tubes). On the right diagram (from Kurth et al., GRL, 2017), the black line is the local electron cyclotron frequency. A, B, C, D and E events correspond to potential radio sources crossing. The radio emissions’ frequency becomes smaller than or equal to the cyclotron frequency of local electrons several times, revealing sources crossings by the probe (by analogy with observations at Earth or near Saturn). At those instants, electrons measured by the JADE instrument correspond to a loss cone of a few keV, thus favoring oblique emissions (a detailled study is presented in another article from the « Geophysical Research Letters » journal, from IRAP scientists: Louarn et al.). Those results, which are still to be confirmed by several other case studies, suggest that the CMI is a universal mechanism. On Jupiter, like on Saturn, where most of the plasma is confined near the equator by fast rotation of the magnetosphere, the CMI seems to be able to operate everywhere above high magnetic latitude regions, where as on Earth it happens only in auroral "cavities". The paper by Louis et al. shows that "oblique" ExPRES simulations with electrons energy in the keV range remarkably reproduce the emissions induced by Io in Jupiter’s magnetic field, observed from low to high altitude, thus proving the good understanding of the mechanisms involved. When the predicted emission angle (top) is ≥70°, the agreement between simulations and observations is excellent. This good agreement between simulations and observations is obtained only when Juno is in the same hemisphere as the radio source studied, whereas emissions predicted to arise from the opposite hemisphere are not observed. This can be explained by a flattening of the emission cone in the meridian plane (predicted by a theoretical study from Galopeau et al., 2016). One also finds that the emission cone has only a 1° width, and the measured emission angle is between 70° and 90° with respect to the magnetic field. Interpretation of those measurements is nevertheless complex, because an orthogonally produced emission inside the source may then be refracted in a oblique direction during its propagation near the source. More examples are thus needed, for several other Juno periJoves before drawing definitive conclusions. When Juno is at low latitude, the "Io-Jupiter" emissions make most of the dynamical spectrum, but when Juno is at high latitude, lots of auroral emissions are superimposed to it. 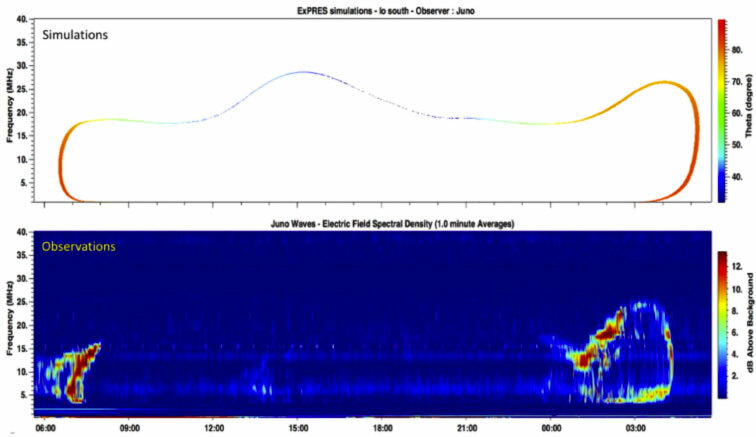 Comparison of simultaneous observations by Juno, the Nançay Decameter Array and Wind allows to identify the origin of each emission. The article from Imai et al. compares 2 particular observations from Juno and from the Nançay Decameter array performed a little before the first periJove, and they confirm the more general results from Louis et al. These first results are promising for the rest of the mission, which will moreover produce a "perfect" model of Jupiter’s internal magnetic field, giving a trustworthy and precise topology of the magnetic field that guides electrons trajectories and defines satellite-Jupiter flux tubes. Kurth, W. S., M. Imai, G. B. Hospodarsky, D. A. Gurnett, P. Louarn, P. Valek, F. Allegrini, J. E. P. Connerney, B. H. Mauk, S. J. Bolton, S. M. Levin, A. Adriani, F. Bagenal, G. R. Gladstone, D. J. McComas, and P. Zarka, A new view of Jupiter’s auroral radio spectrum, Geophys. Res. Lett., in press, 2017. DOI : 10.1002/2017GL072889. Imai, M., W.S. Kurth, G.B. Hospodarsky, S. Bolton, J.E.P. Connerney, S.M. 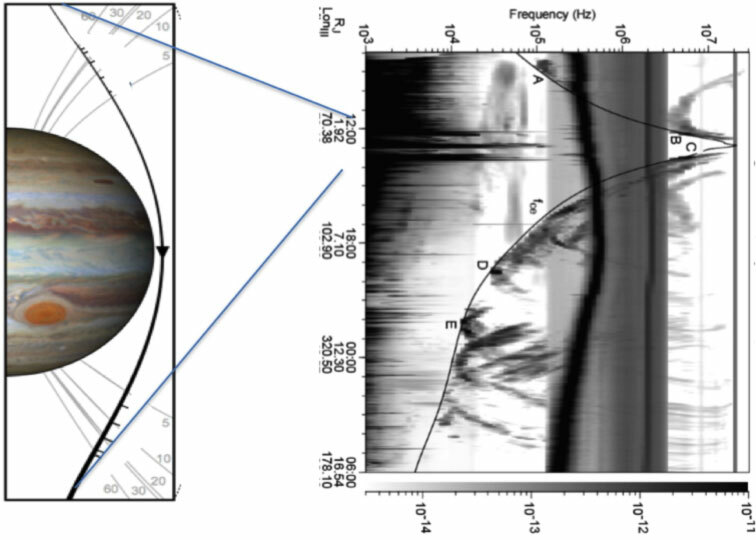 Levin, A. Lecacheux, L. Lamy, and P. Zarka, Latitudinal beaming of Jovian decametric radio emissions as viewed from Juno and the Nançay Decameter Array, Geophys. Res. Lett., in press, 2017. Three researchers from Observatoire de Paris/LESIA, Philippe Zarka, Laurent Lamy and Baptiste Cecconi, have contributed to the cited articles, as well as a PhD student, Corentin Louis, as a first author of one of them.